RAW Calcium/Mag by NPK is a water soluble formulation of 15% calcium nitrate and 3% magnesium sulfate. This is a stand alone supplement that will not leave your media salty. Calcium builds strong strong stems and leaves while magnesium is necessary for chlorophyll production. 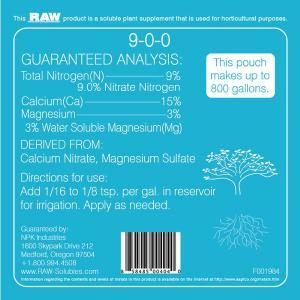 Calcium and magnesium deficiencies are common as most fertilizers overlook these essential micro-nutrients. Applying these two nutrients in combination helps prevent too much magnesium uptake as the calcium acts as a buffer. Very low dilution rate means a little goes a long way. Works in conjunction with all nutrient and feeding programs. Thorough dilution is recommended before mixing with any other nutrient formulation. Calcium/Magnesium nutrients are not recommended for foliar sprays.